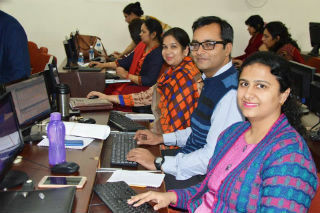 Aimed at enhancing research and teaching capabilities, a six day Faculty Development Programme was organized by JIMS Rohini on 'Computing Technologies - A Panoramic view', from 27th Nov to 4th Dec 2017, specially designed for faculty members of IT department. Such programmes enable the participants; to develop competence in understanding recent advances in Information Technology and to improve pedagogies and presentation skills. The first day of FDP program started with the inaugural session, in which Dr.J.K.Goyal, Director JIMS addressed the participants and emphasized the importance of teaching through examples and practical applications. 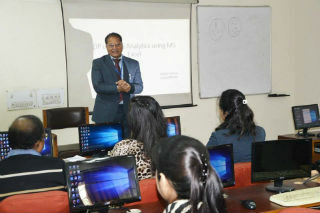 The first session covered the basics of MS Excel and aspects of Data Analytics using various applications in business processes. The session was conducted by Ms. Suman Madan- Assistant Professor, JIMS Rohini & Mr. Sanjive Saxena- Associate Professor, JIMS Rohini. 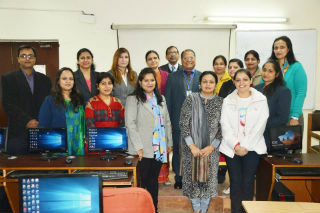 The Second day of FDP was conducted by Dr. Manjot Bhatia and Dr.C. Komalavalli on the topic "Oracle 12c SQL and PL/SQL". Dr. Manjot discussed the new features of Oracle12c and various new clauses in DML statements. 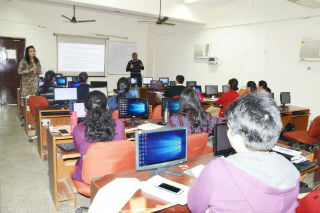 Dr. Komalavalli explained about the need of PL/ SQL and various PL/SQL blocks. 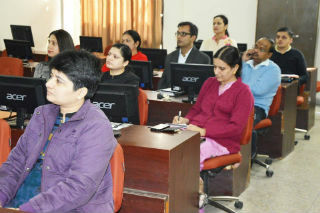 All the faculties practiced the commands during the session through hands-on exercises. The Third Day of FDP was conducted by Dr. Deepshikha Aggarwal on the topic "Adhoc Wireless Networks Working and Applications". It started with the introduction about MANETS and later during the day, various routing protocols were discussed to demonstrate the working of adhoc wireless networks. 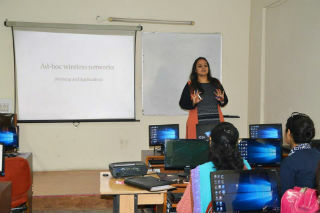 The fourth day of FDP was conducted by Ms. Chetna Laroiya on the topic "Wireless Sensor Network". The Session covered the following topics: "Sensor architecture, WSN OS, DBMS, Emulator, Simulator, NS3, NS3 installation steps and execution of NS3 code". The fifth day of the FDP was conducted by Ms. Deepti Sharma, Ms. Disha Grover and Ms. Suman Madan on "Robotics" which included assembly of the Boe (Board of Education) bots and their programming. The session also included the set-up of LED’s on the Boe-bots. All the faculty members assembled their individual machines and programmed them to operate in different directions and patterns. The last day of FDP continued with the Robotics session. 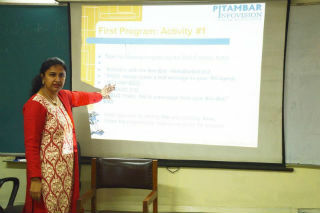 Participants did mini projects on Robotics and then Ms. Suman Madan, Asst. Prof. - JIMS concluded the robotics session with written quiz among the participants. 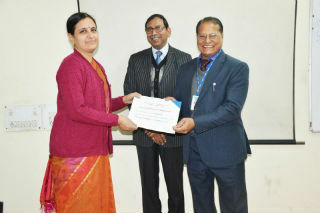 The FDP closed with the valedictory session in which, Dr. J. K. Goyal, Director - JIMS Rohini, Dr. Praveen Arora, HOD-IPU Affiliated Programs and Dr. Sumesh Raizada, coordinator for the FDP, distributed the certificates to the participants.